Google+ What I Made Today: Yesterday, the Day Before . . . I have been remiss in my entries here. It's not that I've been slacking, I've just been . . . prioritizing. Sadly, blogging here took a back seat for a few days. Since my last post I made some herbal capsules, blended some more tea, planted peas and I started a new crochet project, one that could go on for a few more days . . .
You see, I have a boat-load of embroidery floss that I snagged from my mom when she moved. Little by little I am discovering outside-the-box uses for it. There are many, many skeins of this earthy-putty-olive-drab kinda color that I thought I'd see how far I could take. 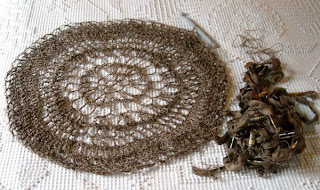 So I started a circular lacy pattern and we'll see how long it takes - and how big it gets - to use up the embroidery floss. So far, it's about a 16" diameter. Of course, it will grow slower and slower as the effort continues. 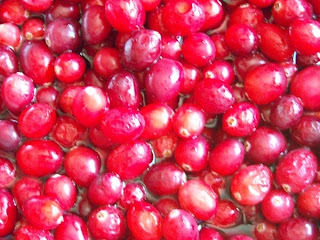 I also thawed nine pounds of cranberries . . .
. . . chopped and combined them with sugar, tea, banana, champagne yeast, love and a few other secret ingredients to start a batch of wine . . .
. . . that's bubbling nicely now and that will be ready for Yule 2008! As for today, more crocheting. I have more garden seeds to get started, herbs to play with and package and other practical matters to tend to as well. Yum - the cranberries look delicious. Would you ever consider selling your herbal capsules on Etsy? I would love to buy such things locally. And . . . I do market some of my handcrafted herbal products. A couple are even on Etsy! But . . . it all depends what you are looking for. If you like, email me from my website: www.walkithewoods.byregion.net ! I see - I shall email you to talk herbals!